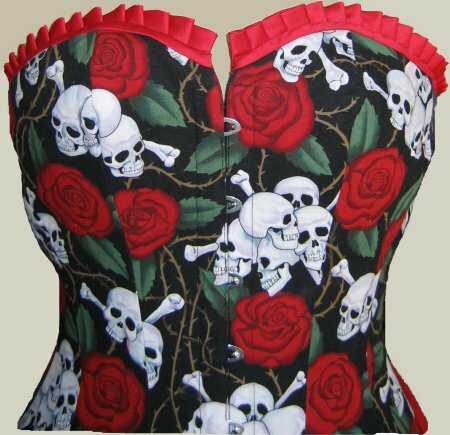 I've seen a number of corsets made from the popular skulls-and-roses fabric and decided that I probably ought to share the one I made for my youngest dear daughter. It was made in October 2007. When I *first* made it, according to the correct sizing *I thought*, I took care to try to match as much of the pattern across the seam lines as possible. When we tried it on her, the dang thing was too big. I was incredibly annoyed. So, I took it all apart, cut it to the *correct* size and resewed it together. And although many of the design motifs matched, more or less, they weren't as good as with the original version. Well .. [shrug] stuff happens, ya know? And the top edge was a little lower than dear daughter wanted, so I put a knife-pleated ruffle behind the top binding. The gap at the center front was closed with a big, ol' industrial strength hook-and-eye. Dear daughter paired the corset with an outfit that I had not originally envisioned accompanying it but it worked out rather well! Layers: Cotton lining, coutil, fashion fabric.